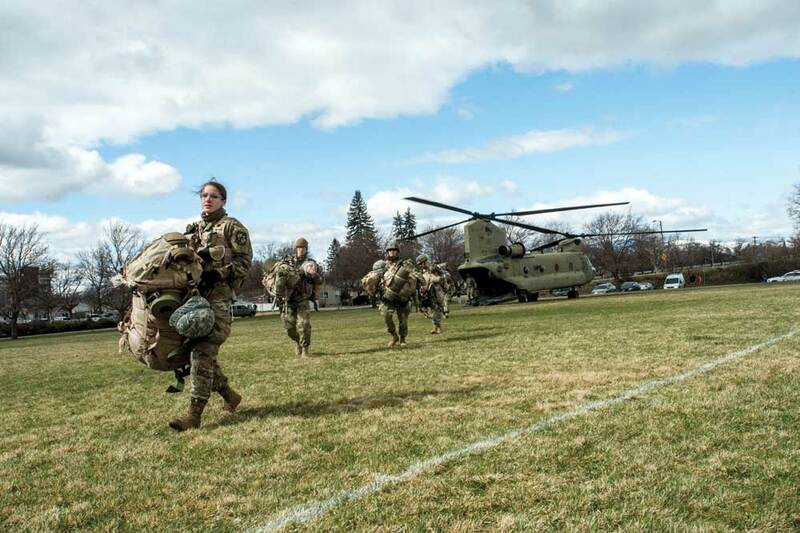 Ashley White, a junior in ROTC, leads a group of cadets exiting a Montana National Guard Chinook helicopter during spring training exercises. It’s an hour before sunrise on a Tuesday in April, and campus is quiet. The Oval is empty, the dorms dark. Behind the shifting clouds, a waning moon and a handful of stars hang in the velvet sky as if they were pinned there. Snowflakes drift to the ground like tiny white parachutes. Somewhere a ventilation system groans to life. And then the east doors of the Schreiber Gym swing open into the stillness. The first thing out of the building is a guidon, a maroon and silver pennant with a Griz print, attached to a wooden pole. Behind that is the young man carrying it. He wears a Kevlar helmet, a load-bearing vest, camouflage fatigues and a rucksack filled with 35 pounds of gear. Behind him, 40 more uniformed men and women pour out of the door in identical kit. They maneuver quickly to the north, beneath the shadowy hulk of Mount Sentinel. The only sound is the murmur of their boots on the pavement. Even the birds are silent. The men are clean-shaven. The women have their hair pulled back. They are lean and fit with a military bearing, but they are not officers – not yet. They are the cadets of Grizzly Company, UM’s Reserve Officer Training Corps. And while the rest of the University sleeps, they are doing what ROTC students do every morning: physical training. Today’s PT is a 5-mile ruck march, which the cadets consider short. On other days they put in 10 or 12 miles. A week ago, six cadets gave up their spring break to compete in the Bataan Memorial Death March, a 26.2-mile slog through New Mexico’s high-altitude desert. Their feet are still raw and blistered. With the guidon always at the front, the company tramps through snow over the Clark Fork River on the Van Buren Footbridge and crosses East Broadway. Bleary-eyed commuters watch them through their windshields. The cadets move at their own pace; some walk, others run. Cadet Chris Blaser is among them. A 19-year-old sophomore from Boise, Idaho, Blaser has been set on serving in the military since high school.He came to UM on a full-ride ROTC scholarship. The scholarship has conditions: He must maintain good grades, perform well in physical training and stay out of trouble. If he falls short, he’ll have to pay back the scholarship. And when he graduates, he’ll have to repay the Army with four years of service, plus two years in the reserves. Blaser is undaunted. Blaser turns off the road at a trailhead, where a path snakes up the side of Waterworks Hill. By now, other cadets are already on their way down. Blaser encourages them as they jog past. But here on Waterworks Hill, he is midway into a lesson in the other half of his education – the half that is preparing him to be a lieutenant in the Army. Students like him have been training at UM to serve in the military for 100 years now. Blaser seems to relish it. His uniform matches the tawny tufts of grass poking out of the fresh snow. His cheeks are red with exertion. His eyes are bright. “There really isn’t a better way to start your morning,” he says. The idea of training future military officers on college campuses goes back to 1819, when Capt. Alden Partridge endeavored to create “citizen soldiers” at Norwich University in Vermont. Later, the Land Grant Act of 1862 gave each state 30,000 acres to create institutions of scientific learning. In return, these institutions offered courses in military tactics. But the ROTC as we know it wasn’t born until President Woodrow Wilson signed the National Defense Act of 1916. World War I was raging in Europe, and the U.S. Army needed an influx of educated officers. Universities around the country stepped up to fill the need by creating military commissioning units on their campuses. The idea stuck. 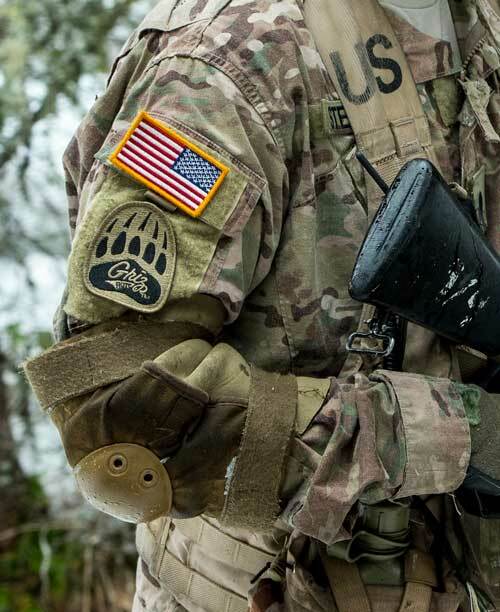 Today, more than 270 Army ROTC programs operate at universities and colleges around the country, comprising the largest officer-producing entity in the military. The program’s principles are emblazoned on the black and gold ROTC shield. A lamp signifies the pursuit of knowledge. A sword represents the valor of soldiery. And a Greek helmet recalls the ancient concept of the warrior-scholar who wielded both. 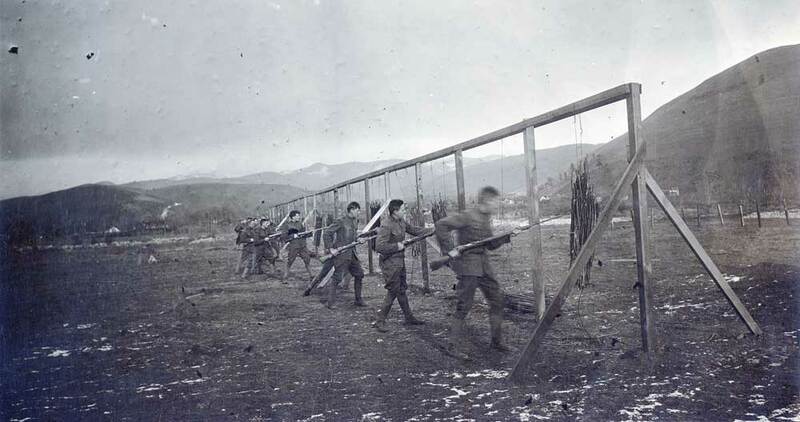 UM created its ROTC program in 1918. Two years of participation was mandatory for all male students. Cadets dug trenches on campus, erected canvas tents and practiced bayonet drills between classes. Over the years, interest in ROTC has mirrored the ebb and flow of U.S. military engagements. In the 1960s, the University ended mandatory participation in ROTC due to the protests over the Vietnam War. In the 1970s, women were allowed to join. Then in 2000, UM’s ROTC program partnered with Carroll College in Helena. Together, about 75 cadets from Grizzly Company and Saints Company make up the Grizzly Battalion. The man commanding that battalion is Lt. Col. Chad Carlson, the son of a game warden from Big Timber. He works out of an office in a wing of the Schreiber Gym, the home of UM’s ROTC since 1926. Carlson has short red hair and an easy smile. He was commissioned as an Army officer after graduating from the ROTC program at Gonzaga University in 1997. He served two tours in Iraq, where he specialized in the dissection and disposal of improvised explosive devices. He’s now in his 21st year of active duty and his fourth year as the leader of Grizzly Battalion. 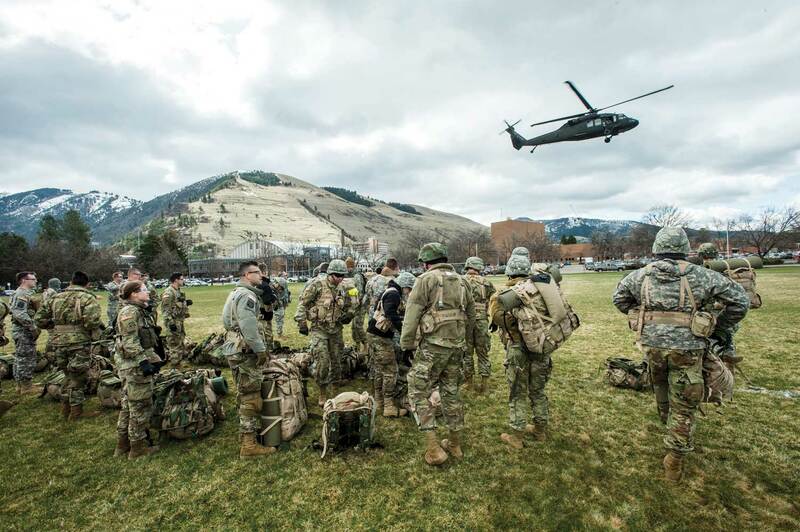 Carlson says that while the ROTC curriculum and physical requirements have changed over the past century, the fundamental goal is the same: to create quality leaders for the Army. Those skills make cadets successful in civilian careers, too. Not all ROTC graduates go on to active duty in the military. Some choose to go into the National Guard or the Army Reserves. Some serve their required time and start civilian careers. Whatever they end up doing, Carlson says the cadets benefit from training at a civilian university. Carlson says the University benefits as well. They get bright, driven students who graduate on time with scholarships paid by the government. The cadets enrich the campus life in other ways, too. That’s why Carlson and the other instructors – they’re called cadre – stress the importance of engagement. Cadets work parking detail during sporting events. The color guard performs at local events. And, most audibly, they fire a replica mountain howitzer cannon in Washington-Grizzly Stadium after the national anthem and every Griz score. Carlson says he’s often impressed with the way ROTC students take risks to develop themselves. One cadet was afraid of heights, so he signed up for airborne school and learned how to jump out of airplanes. “They are willing to challenge themselves, academically and mentally,” he says. He also thinks the program is stronger because of its location. Cadets here conduct training exercises in real wilderness environments. The majority of cadets are from Montana, and Carlson has noticed they tend to have good situational awareness – they notice deer on the side of the road, for example. They also tend to be raised on a strong ranching and farming work ethic. The Grizzly Battalion has commissioned 1,940 officers in the past 100 years. Its alumni include two three-star generals, five two-star generals and three one-star generals. There’s no telling how far the current cadets will go. That’s why it doesn’t feel like a chore for Carlson to report to Schreiber Gym before dawn each morning to meet them for PT. Retired Army Brigadier Gen. Colleen McGuire was once one of those kids. She grew up in Missoula and joined the Army Reserves while she was still at Sentinel High School. In 1978, in her junior year at UM, she became a cadet in Grizzly Company. The program was then 60 years old. McGuire was the only woman in her class group. She had different PT standards but otherwise she was treated like the men. “You still had to put so many rounds downrange and hit a target,” she says. McGuire excelled at shooting. Her father served 30 years with the Army Reserve and would often take the family out into the woods for a picnic and target practice. Backpacking and navigation were second nature to McGuire, skills that came in handy during her ROTC training exercises in the hills around Missoula. McGuire was active on campus in other ways. She was a cheerleader and a member of Delta Gamma. She was an involved student in the School of Journalism. But it was the ROTC program that gave her some of her closest friends and the personal development that has reverberated throughout her life. McGuire applied those lessons well. Upon her graduation in 1979, she had a gold bar pinned on her shoulder and became a second lieutenant in the Army’s military police. After 33 years of service, McGuire had risen to become the first woman Provost Marshal General of the Army – the chief of military police. She credits her success in part to UM’s ROTC program, which gave her a civilian college experience with training that prepared her for a military career. And even though a lot has changed in the 40 years since she was a cadet, McGuire says she would do it all over again if she could. Cadet Jane Summers wasn’t feeling very balanced last spring when she found herself alone in the woods with a map and a compass, in the middle of the night. In fact, she was feeling hopelessly lost. 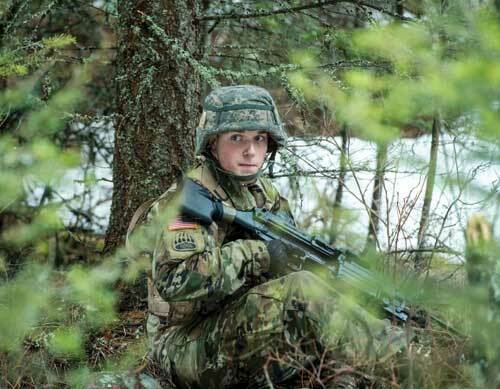 Summers, an athletic student from Arroyo Grande, California, had just joined ROTC as a sophomore and was making her first solo attempt at land navigation in Lubrecht Experimental Forest outside Missoula. Navigation didn’t come easy for her, but she had prepared for this exercise. She was in uniform, with a load-bearing vest, a backpack and a red-tinted headlamp. All the cadets had been given different coordinates to locate a small red box tied to a tree branch with a code on it. Summers had plotted her coordinates, measured the degrees on her compass, charted the distance and planned her route. But now, she couldn’t make heads or tails of the map. The trees gave up no secrets. Hours passed, and she didn’t see a single other cadet. So she took a few deep breaths. She told herself she could do this. And she tried to figure out where she was. She found a dirt road that she couldn’t locate on the map. She followed it to an intersection and eventually returned to her starting point. She tried again and found her red box. On Wednesday afternoons, she practices small-unit maneuvers in Pattee Canyon, sometimes in knee-deep snow, with all her gear and a rubber duck rifle. She also finds time to practice swimming 100 meters in her uniform and honing her accuracy with an M-9 pistol. She has a busy summer ahead of her, too. She’ll attend Advance Camp in Fort Knox, Kentucky, a national gathering of ROTC cadets that tests the skills they’ve learned and ranks their performance. After that she’ll go to Indonesia for a cultural training with that country’s navy. Summers doesn’t know how her career in the military will pan out. But she’s happy with the path of personal growth she’s charted with ROTC. And she’s come a long way from that night she was lost in the woods. Jacob Baynham graduated from UM with a journalism degree in 2007. He writes for Men’s Journal, Outside, and other magazines. 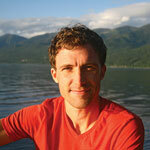 He lives in Missoula with his wife, Hilly McGahan ’07, and their son.